A couple of weeks ago I posted about a new terrain set that I had purchased and last week I posted a few pictures and ideas on alternative layouts. The set in question was the Infinity Scenery Packs, Navajo Outpost. This set comes with four building and six containers plus the mat and all for the princely sum of 8 English pounds. Well, after having it a few weeks and playing a few games, including my first two full games of kill team, on the set, I have come to really like it. It is simple and cheap but provides everything you need for gaming. Yes you can get better looking set but they are also a lot more expensive, like a LOT more expensive. There are a couple of downsides, which I shall get to in a moment but overall I highly recommend the set, which is why I decided to bite the bullet and bought another. The Kurage Station is a slightly different set, with a different aesthetic to the outpost but one that I think will work for my kill teams. I did ponder going completely different and very "alien" but in the end I settled for a more human\imperial vibe. There are several reason I bought a second set, for variety and playing options, so that I'm not always using the same board but also cos there's bridges and who doesn't like bridges. Yep, that's pretty much the main reason I bought a second set, cos it's got bridges, two of them in fact. It comes with 4 buildings, 6 small containers (about half the size of the other set) and the two bridges plus the mat as well. Again this lot cost me 8 pounds, so for around 20 pound (ncluding all the postage) I have two boards with scenery, not bad really. Now I did say there was some negatives, two really, both of which I could solve easily, probably with just one solution. 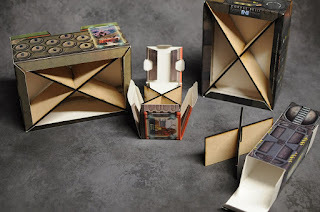 The trouble is that the building and crates are very light and are easily knocked during the game, as happened several times in my kill team games. Secondly, the big building get a bit wobbly and deform when loaded with models, especially big ones like the new plague marines or a couple of deathwatch. There seems to be a simple solution to all this and it's to fit MDF frames inside. Now, I got the idea from eBay, where someone was selling sets of MDF frames, which were basically two lengths of wood in an X shape that fit across the insides of the building from corner to corner, bracing the set and also adding some rigidity of the center, stopping deformation I noticed when the models were on top. Unfortunately I can't seem to find them anymore, which isn't a problem as I wasn't going to buy them but I wanted to show another club member, who has a laser cutter, to see if he could knock a bunch up for me. I probably could do it myself with the MDF sheets I already have but getting them laser cut would be better. I'll just have to rely on my descriptive powers instead, what could possibly go wrong! I can't imagine it will cost much for a few bits of MDF, so even after I get them the scenery sets will still be excellent value for money. Edit: found the after writing the post and and a bit of an internet trawl.